This article was peer reviewed by Vildan Softic. Thanks to all of SitePoint’s peer reviewers for making SitePoint content the best it can be! Babel is a source-to-source compiler; turning ECMAScript 2015 (formerly known as ES6) code into ECMAScript 5 code. Since the environment is Chromium, there are already a lot of supported ES2015 features available. But instead of always looking up which ones are implemented, I recommend using Babel to transpile your code. In a later release — when ES2015 is better supported in Chromium — you can deactivate Babel again and keep your code base (almost) untouched. To activate transpiling with Babel, each file needs a 'use babel'; statement at the beginning, similar to strict mode in ECMAScript 5. This gives you also the ability to decide which files should be transpiled and which not, by omitting the statement. The important keys are main — defining the main entry point of your package (defaults to index.js/index.coffee) — and engines — telling Atom on which version your package runs. There is also a set of optional keys available, documented in the “wordcount” package documentation (section package.json). All your package code belongs in the top-level directory lib/. I recommend having your entry point in this folder as well, as it keeps the structure clean and makes it easier to scan the project. Your main file must be a singleton object that maintains the entire lifecycle of your package. Even if your package consists only of a single view, it will all be managed from this object. Your entry-point requires one activate() method, but should also have the optional deactivate() and serialize(). // This is your main singleton. // The whole state of your package will be stored and managed here. // Activates and restores the previous session of your package. // When the user or Atom itself kills a window, this method is called. // an object containing all required data. The activate() function is the only required method. Initialise all your modules, views or helpers here. It is passed an object, containing the previous serialized state of your package. If you don’t serialize anything in your package, it will be an empty object. That means, it is entirely up to you and your package architecture on what to serialize. The deactivate() method is optional, but important. It will be called by Atom when the window is shutting down, or the user deactivates it in the settings. When your package gets deactivated by the user, and you don’t dispose of added events/commands, they are still available. This isn’t a problem when Atom is shutting down the window. It will tear down events and commands. But if your package is watching files or doing any other work, you should release them in deactivate(). A package usually subscribes to multiple events like adding custom commands, listening to changes, or modified files. It is possible to bundle these into an instance of CompositeDisposable(), and this way they can all be disposed of at once. // subscriptions will be disposed of at once. // Code to toggle the package state. Serialization is a powerful, but again optional, feature of Atom packages. Serialization/deserialization happens when a window is shutting down, refreshed or restored from a previous session. It is up to you to define which and how many of your components should serialize their data. What’s important is that it returns JSON. If you have a view, and want that to be able to be refreshed, you need to make it compatible with serialization and deserialization. This very basic component takes an object, which will be used as the component’s internal data. Your component then might do some work with the data and can allow its state to be serialized via the serialize() method. // is restored by Atom. // or save your data by Atom. // The "deserializer" key must be the name of your class. To make all this useful, this component must be called and serialized in your packages main singleton. // your components static 'deserialize()' method. // to save the current state. All objects you want to serialize need the serialize() method. It must return a “serializable object”, and a deserializer key with the name of a registered deserializer. According to Atom, “it usually is the name of the class itself”. Additional to that, a class also needs the static deserialize() method. This method converts an object from a previous state to a genuine object. In order to make all this possible, you have to add your class to the deserialization system with atom.deserializers.add(). A pane is the individual window in Atom. It contains all open tabs, called “items”. These panes are stored in the atom.workspace object. With atom.workspace.getActivePane() you are requesting the current active pane. A pane object doesn’t contain any DOM elements, but all the instances of Atom’s internal components (e.g. TextEditor, GutterContainer, NotificationManager). Understanding these panes is essential to create custom views for your package. // that our view won't work with any data. // Here we add the custom view to the modal panel of Atom. // We destroy both the custom view and Atom's modal. The atom.workspace.addModalPanel() method adds a modal element to Atom’s workspace. If you want to add a custom view to a pane (e.g. for a settings page) there is a bit more work required though. Package configuration should be described in JSON Schema. To add settings, your package object needs a config key with the data. Alternatively you can move the configuration to a config-schema.json file and import it. This keeps your configuration separated and your architecture organised. This creates the configuration on your package’s settings page automatically. A list of all supported types can be found on the configuration page of Atom’s API documentation. Your settings object, along with all other package configuration, are stored in the atom.config object. You can get and set any key of your configuration with the get() and set() methods. It is also possible to get either Atom’s general settings or other packages’ settings. If you want to interact with other packages, you need to provide and consume services. To listen for changes, you can either observe the config for changes, or have a listener — called onDidChange() — to a key path. Both of them return a Disposable which you can .dispose() to unsubscribe. Menus and keymaps make your package’s functionality accessible to the user in the Atom environment. They are linked to specific commands of your interface. If your package can be toggled, open a view, do some custom action or anything else, it should be available to the user. The menu definition can be either stored as a JSON file in the menus/ top-level directory or in the menus key of your package.json. The following example adds commands to the Packages menu bar and to the context menu of the editor. The context menu appears when right-clicking inside of the editor. With keymaps you define shortcuts for your package commands. They are tied to a specific scope, where the scope is a CSS selector like atom-text-editor, atom-text-editor:not([mini]) or atom-workspace. When an element matching the selector is in focus, and the keystroke pattern is used, your custom action is emitted. Keep in mind that these commands must have been registered (atom.commands.add()) in your entry-point. Debugging in Atom isn’t much different to debugging on the web. 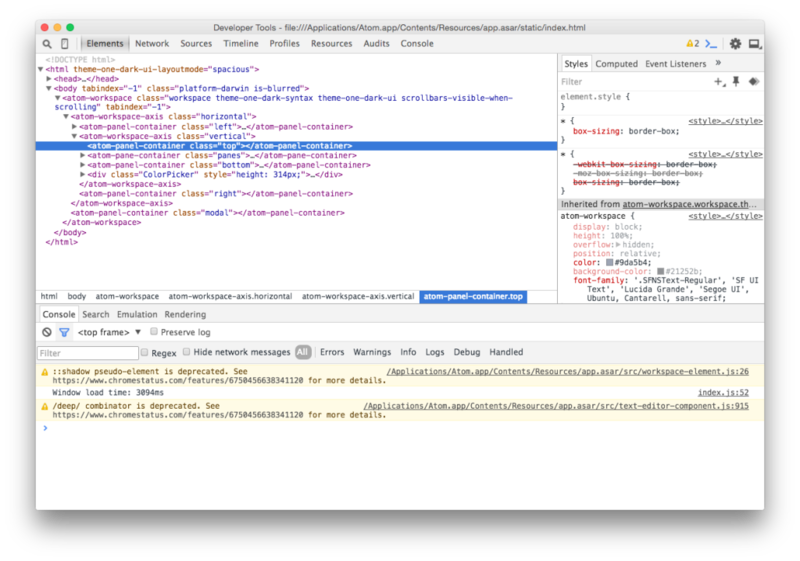 You can activate the Chrome Developer Tools under View > Developer > Toggle Developer Tools to view thrown errors, logs from your code or get an understanding of Atom’s markup. Atom uses the Jasmine framework for its tests. Tests are placed in the spec/ top-level directory and files within must end with -spec (e.g. fancy-component-spec.js). Tests aren’t required to run your package or publish it, but they are a good way to back up the quality of your code and make sure nothing breaks when adding new features. To run your tests, you can either use the window:run-package-specs command or go to View > Developer > Run Package Specs. If you want to run your package specs on Travis CI, there is a brief post on Atom’s blog on how to set it up. That was a lot of input. The actual flow or execution order of Atom is roughly as follows (note: tests aren’t part of the package flow). I hope my article has helped you to get a basic understanding of Atom package development. There is still a lot more functionality, and many topics, which unfortunately can’t be covered in just one article. Take a look into the Atom Flight Manual to see what else is possible. What package will you develop? Moritz is a German front-end developer living in Berlin. Although Germans typically have a thing for extra long compound words, he's a friend of short functions.